49-51 Commonwealth are located on the north side of Commonwealth, between Berkeley and Clarendon, with 45-47 Commonwealth to the east and 55 Commonwealth to the west. 49 Commonwealth was designed by Cummings and Sears, architects, and built in 1877-1878 by Weston & Shepard, builders. 51 Commonwealth was built in 1876-1877 by J. & H. Harmon, builders, and probably also was designed by Cummings and Sears (Bainbridge Bunting’s Houses of Boston’s Back Bay indicates that 51 Commonwealth was designed by Cummings and Sears; the original permit application and final inspection reports do not identify the architect). 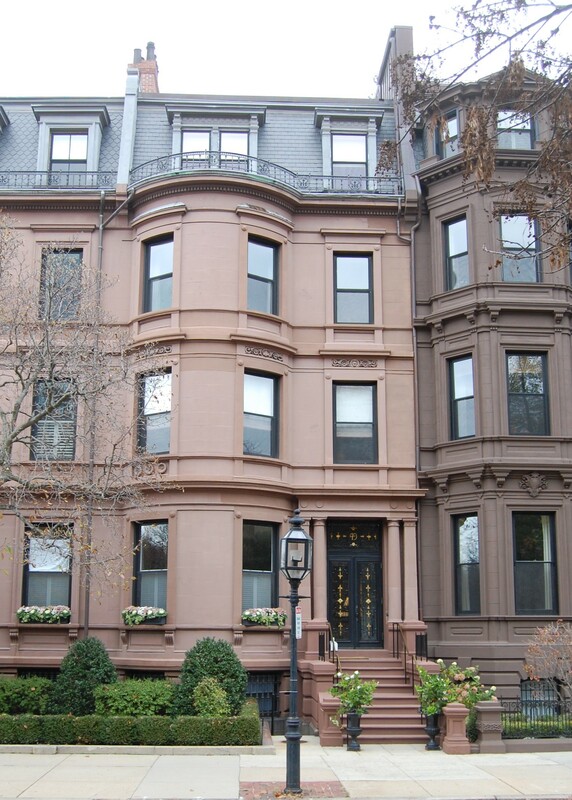 The two houses were built to form a complementary design and, according to Bunting, were the last houses of the Academic design built in brownstone in the Back Bay. 49 Commonwealth was built on a single 26 foot wide lot; 51 Commonwealth was built on a double lot, 52 feet wide. 49 Commonwealth was built in 1877-1878 as the home of marble manufacturer and dealer Charles Torrey and his wife, Adelaide (Bowen) Torrey. They previously had lived at 24 East Brookline. He is shown as the owner of 49 Commonwealth on the original building permit application, dated July 30, 1877, and on the final building inspection, dated October 22, 1878. Charles Torrey purchased the land for 49 Commonwealth on May 9, 1877, from Alexander Sylvanus Porter. The land originally was purchased from the Commonwealth of Massachusetts on February 11, 1870, by Charles Greenleaf Wood. Click here for an index to the deeds for 49 Commonwealth. Charles and Adelaide Torrey lived at 49 Commonwealth until his death in April of 1905. By the 1906-1906 winter season, Adelaide Torrey had moved to Haddon Hall at 282 Berkeley. On October 26, 1905, 49 Commonwealth was purchased from Adelaide Torrey by Mary Elizabeth (Woodhull) Perry, the widow of Gardner Blanchard Perry. She also maintained a home, Montpelier, in Middletown, Rhode Island. Gardner Blanchard Perry had died in March of 1899. He had been a hide dealer in Buenos Aires for many years. Mary Perry continued to live at 49 Commonwealth until her death in December of 1910. On June 22, 1911, 49 Commonwealth was purchased from the estate of Mary Perry by dry goods merchant Henry Coffin Everett. He and his wife, Ellen Crocker (Tufts) Everett, made it their home. They previously had lived at 353 Commonwealth. They also maintained a home at Old Colony Hill in Hingham. Ellen Everett died in September of 1930, and Henry Everett continued to live at 49 Commonwealth until about 1936, when he moved to Newton Centre. In January of 1936, he applied for (and subsequently received) permission to convert the property into a lodging house. By 1937, 49 Commonwealth was the home of Henry Lawton, a watchman, and his wife, Winifred M. (Lyons) Lawton, who operated the lodging house. They previously had lived in England. By 1939, Henry Everett had resumed living at 49 Commonwealth, as a lodger, as well as in Newton Centre. He continued to live at both residences until his death in November of 1945. The Lawtons continued to live at 49 Commonwealth until about 1940, but had moved to 215 Commonwealth as lodgers in 1941. By 1942, they were operating a lodging house at 14 Marlborough. On August 1, 1940, 49 Commonwealth was acquired from Henry Everett by the Boston Five Cents Savings Bank. It did not take the property in foreclosure, but did hold a mortgage from Henry Everett which it assumed as part of the transaction. On April 22, 1942, the property was acquired by Warren-Stevens Inc.
By 1941, 49 Commonwealth was the home of Eva (Evangelina) Harriett (Martin) Cotter, the widow of James Angus Cotter, who operated it as a lodging house. On May 28, 1942, she acquired the property from Warren-Stevens Inc.
Eva Cotter continued to live at 49 Commonwealth until about 1944. On March 26, 1945, 49 Commonwealth was acquired from Eva Cotter by Simmons College. 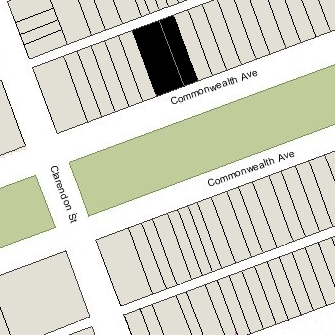 It had acquired 51 Commonwealth in December of 1944, and subsequently combined the two buildings. 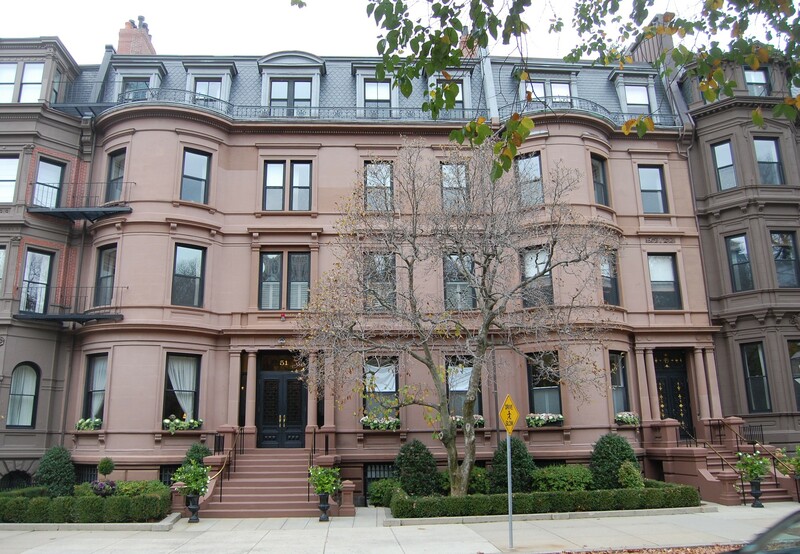 51 Commonwealth was built in 1876-1877 as the home of shipping merchant and investor George Augustus Gardner. He previously had lived at 81 Marlborough with his wife, Eliza Endicott (Peabody) Gardner, who died in January of 1876. He is shown as the owner on the original building permit application, dated April 24, 1876, and on the final inspection, dated September 1, 1877. George A. Gardner’s father, John Lowell Gardner, purchased the land for 51 Commonwealth on May 18, 1872, from his brother-in-law, Francis Cabot Lowell (Francis Lowell’s wife, Mary Lowell (Gardner) Lowell, was John L. Gardner’s sister; she had died in August of 1854). Francis C. Lowell had purchased the land from the Commonwealth of Massachusetts on February 17, 1864. Click here for an index to the deeds for 51 Commonwealth. John Lowell Gardner died in July of 1884, and on October 23, 1884, George A. Gardner purchased 51 Commonwealth from his father’s estate for $50,000 (the price at which John L. Gardner’s will specified his son could purchase the house). George Gardner’s four surviving children — George Peabody Gardner, Ellen Gardner, John Lowell Gardner, II, and Olga Eliza Gardner – lived with him at 51 Commonwealth. George P. Gardner married in June of 1884 to Esther Burnett and they moved to 186 Beacon. He was a trustee and later would serve as president of various textile companies. Ellen Gardner married, also in June of 1884, to Augustus Peabody Loring, an attorney. 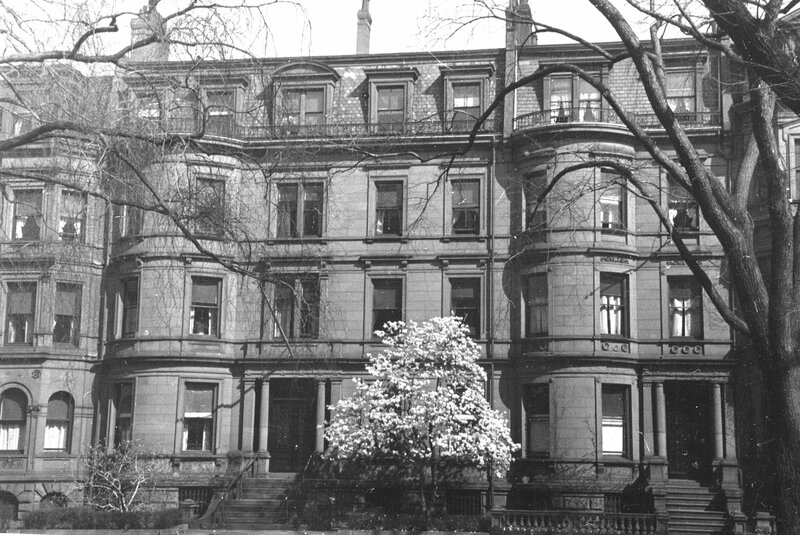 After their marriage, they lived at the Hotel Copley at 18 Huntington. Olga Eliza Gardner married in June of 1897 to Dr. George Howard Monks and they moved to 267 Beacon. George Gardner continued to live at 51 Commonwealth until his death in August of 1916. 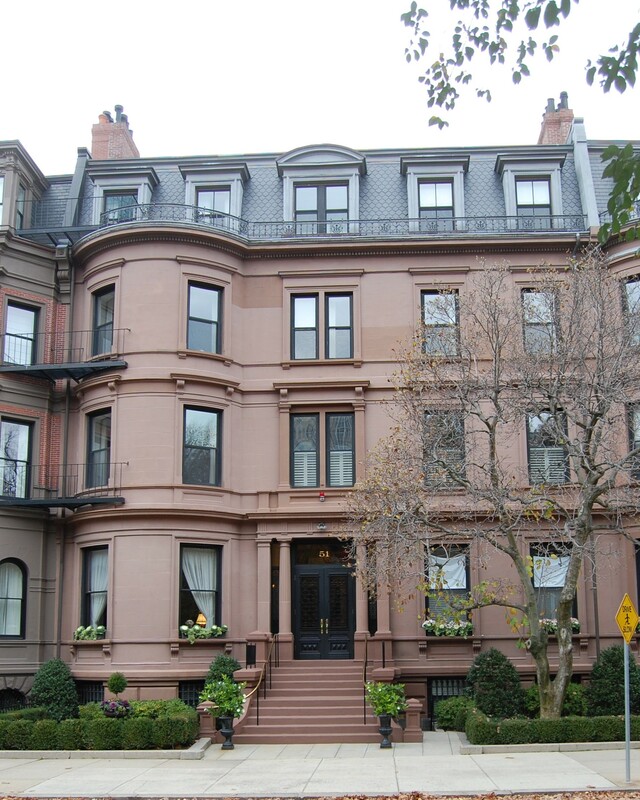 John Lowell Gardner, II., continued to live at 51 Commonwealth during the 1916-1917 winter season, but moved thereafter. On November 13, 1916, Olga (Gardner) Monks purchased 51 Commonwealth from her father’s estate, and George and OIga Monks made it their home. They previously had lived at 67 Marlborough. They also maintained a home in Monument Beach. George Howard Monks was a surgeon, specializing in plastic surgery, and professor of surgery at Harvard Medical School and Harvard Dental School. George Monks died in January of 1933. Olga Monks continued to live at 51 Commonwealth until her death in April of 1944. On December 15, 1944, 51 Commonwealth was acquired from the estate of Olga Monks by Simmons College. In March of 1945, the college acquired 49 Commonwealth, and in April of 1945, it applied for (and subsequently received) permission to combine the two houses and cut doorways in the party wall on several floors. 49 Commonwealth became Simmons College’s Prince School of Retailing, and 51 Commonwealth became its School of Social Work. From the mid-1960s, the School of Social Work (later the School of Social Service) occupied both buildings. On September 11, 2002, 49-51 Commonwealth were purchased from Simmons College by Beal Ventures XI, LLC (Robert L. Beal, manager). In August of 2002, prior to finalizing the acquisition, Beal Ventures filed for (and subsequently received) permission to remodel the buildings into nine units, with an underground parking garage for fourteen vehicles. On October 30, 2003, it converted the property into eight condominium units, the Fifty-One Commonwealth Condominium. Several of the condominiums were purchased by the same owner and combined, and in February of 2004, Beal Ventures filed for (and subsequently received) permission to reduce the number of units to five.